Select the zip file that you saved in Step 1. You should receive a message once the upload is completed. The Pinnion Plugin is installed. You’ll need an account at secure.pinnion.com in order to create your Pinnions. An email will be sent to the email address that you provided. Click the link in the email. Your account is now confirmed. You can sign-out and close the window or tab in your browser. You’re now ready to create your first Pinnion and post it to your blog or webpage, directly from your WordPress account! Click “Settings” and enter the username and password that you created in the Account Creation process, above. This will connect your WordPress site to your Pinnion account. Congratulations! You only need to complete the steps above once. Follow THESE STEPS to create a Pinnion. In the sidebar of your WordPress dashboard, click Editor and log in using your Pinnion username and password. 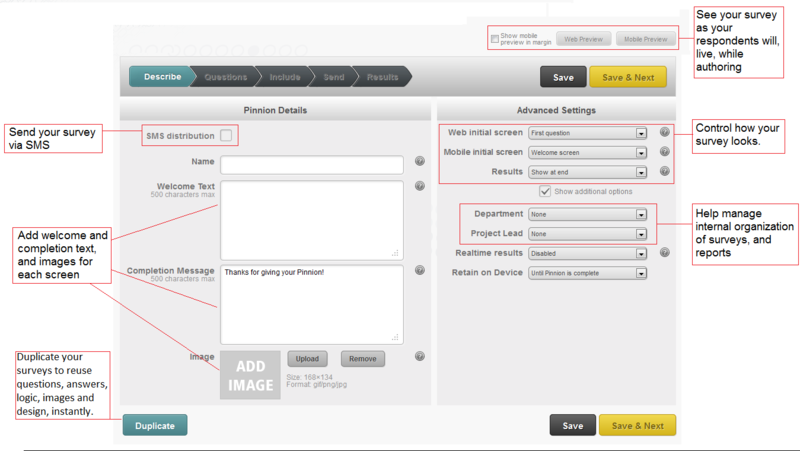 Once logged into the Pinnion tool, Click the yellow “New Pinnion” button to begin the process. You will find the button at the top right side of the “Pinnions” page. Click “Add Image” if you would like to include a picture on the Intro screen. You can always come back to this screen to change these settings later. After you have finished on the “Describe” tab, the “Questions” tab is the next step. Here you can author your first question in the center pane, and the associated response options in the right Pane. The Left pane — is the list of questions in your pinnion, here you can add new questions, duplicate existing questions, delete questions, and re-order questions. Use the “Add Another Question” button to add as many questions as you like. The Center pane — is the question authoring section where you can enter question text, select input types, and add many advanced logic features like quiz functions using the blue gear at the top of the pane. + Add as many answer options as you like, with text and/or images for each. Or select a keyboard type for open responses. + Beyond these basic options, for each question you can find additional Logic and Quiz settings by clicking on the gear icon at the top of the center pane. The Right pane — is the answer option entry section. If you are collecting open text this will be blank, otherwise add your answer options here. When you’re finished writing your questions, click the “Save & Next” button. You can always come back and make changes before distributing your Pinnion. In the left-side menu in WordPress, find Appearance and then click Widgets. Find the “Pinnion Widget” in the “Available Widgets” box. Click and drag the bar into as many of the sidebars as you like. Find the Pinnion Widget under each sidebar and click the down arrow. Use the dropdown box to select the Pinnion that you want to display, then click Save. In the left-side menu in WordPress, find Posts or Pages (whichever you want to create) and click Add New. Begin typing your blog post or page content. Make sure you are in Visual editing mode, not HTML. When you are ready to insert your Pinnion, click the “P” logo button in your toolbar. Use the drop-down box to select the Pinnion that you want to display, then click Insert. To distribute your Pinnion so respondents can see it and respond, go to the “Send” Screen. Click the “Send” button at the bottom of the screen. To stop distribution of your Pinnion, on the “Send” Screen, click the “Recall” button. You can always re-distribute you Pinnion. To redistribute a previously distributed Pinnion, click the “Send” button again. The survey will be available until its expiration time.